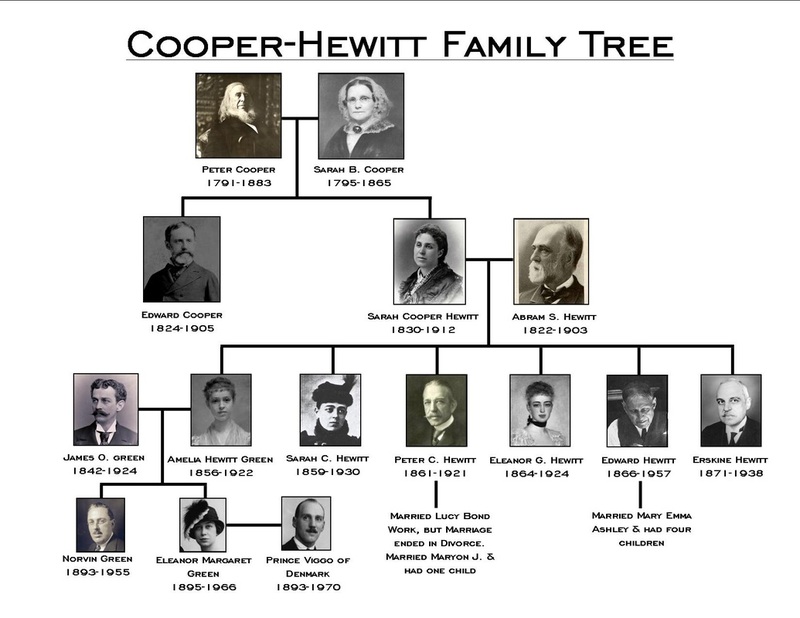 The Cooper and Hewitt families first came together when Abram S. Hewitt met Edward Cooper (Peter Cooper's son) at Columbia College. The two became good friends and Hewitt became a fixture around Peter Cooper's home. Hewitt also tutored Edward during their time at Columbia, and after graduation they traveled to Europe together. Edward and Abram wanted to go into business together at the Trenton Iron Works, but needed more financial backing. Peter Cooper agreed to assist and became a partner in the business. This would be the first of many businesses the families would own together. Eventually, in 1854, the partners purchased the Ringwood property and iron mines. While spending a great deal of time with the Cooper family, Abram met Edward's sister, Sarah Amelia, and fell in love. After more than five years of courtship, the two were married. They first lived together in Trenton, but eventually moved in to Peter Cooper's home on Lexington Avenue in New York City, which the families shared until Cooper's death. Sarah Amelia Hewitt eventually remodeled and expanded the home at the Ringwood property, creating Ringwood Manor. This would become the summer estate for both the Cooper and Hewitt families. The Hewitts had six children, all of whom led very productive and interesting lives. Additional information on each of the main family members can be found by clicking on their names in the expanded History navigation bar on the left. Many of the family members share names with their ancestors and the previous inhabitants of Ringwood Manor. It can be very confusing to keep track of the various family members and when they lived. Please see our very short family tree below to help!